You need to cut this out. I'm supposed to be treating patients and all I want to do is sit in front of my laptop and drool over your cars and barn! BTW one more to go. Stay tuned will be up in a few hours. I don't know that i'll ever have the opportunity to drive any of those cars in my life, but i can dream. I'd love to take a real tour of the barn some day, perhaps around LOG next year. Despite owning the Plus 2 I still had a hankering for a Cortina and was actively searching for one. In the process of doing so I also was looking at a number of other cars including an S2 Elan. Cars Dawydiak had been listing a really nice Europa for some time and I had followed the asking prices downward spiral as if it was my stock portfolio. When it finally got down to what I considered reasonable I called and put in an offer. A counteroffer later and we made a deal. For the longest time I didn't quite get what people saw in Europas but this particular one really piqued my interest. Since getting it I have found it to be a fantastic drivers car. Of all my road cars it is definately my favorite to drive. There is so much to like about this particular car. I love the Colorado Orange, it is the classic equivalant of Chrome Orange. And since I like my Lotus to be original, I don't think I could find a more original car than this one. There is a sticker in the glove compartment that tells you what size wheel and tire are supposed to go on the car. The original tool kit is with it and complete. And, many people just wouldn't care about this, but, the original smog equipment is installed as well. Note the long black vapor canister at the front of the engine bay, and the silver cross-over tubes to warm the intake with hot exhaust at start up. Most Europas had this eaquipment removed at the time the customer took delivery. I even love the lack of radio. Why listen to the radio when there is a Lotus Twin-Cam a few inches behind your ear. I recently had a teenage girl, Lena, staying with us for a week. I offered to take her for a ride in a Lotus as I drove the proposed route for a scenic drive. When I asked her which car she wanted to go in it was not surprising that she chose the Elise. A few days later I got a call from AAA that my Antique plate was in, but the DMV had messed up the VIN on the title, and could I bring the car down to confirm the VIN, and I could pick up the plates and file the paperwork for VIN correction at the same time. I asked Lena if she would like to come along, and, of course, she did. After driving in the Europa she declared it to be more fun than the Elise. Speaks volumes really. Last edited by lotus69f2; 09-04-2009 at 04:58 AM. Like so many things Lotus I have gotten involved in this thread got out of control. What started as a simple documentation and showing of my Barn became a documentary. It took a lot of time, but I was happy to do it and had fun to boot. I hope those who have and who will read this thread will enjoy it, learn something and come away with a greater appreciation for and enthusiasm for Lotus. If anyone would like more information on anything I've posted, or sees something in a photo that isn't explained, or has an unanswered question about the design and execution of the Barn, just post and I'll do my best to help. For now though, this is the end. Ok, this is the end. I'm glad it got "out of control", i've enjoyed reading the story, and like i said, if i could ever see the barn in person i'd enjoy it greatly. I hope i can get to a place where i can have a collection of cars and a place to store them even close to this. I told him the local dealer was Rothrock, and how to get there, and suggested it would be a good idea to visit and ask about ordering one. A week later he called me again to tell me he had just bought one. Storm Titanium, Sport and Touring, hard top. Fully loaded. I offered right away to keep the Elise for him. He accepted and as of Easter 2009 she'd been in the Barn. Not my car, but part of the stable. At least for now. ...thank you so, so much for posting this - your thread has been a real treat to read over the past few days...and your europa is still gorgeous!.. Yes, this has been one of the best threads on Lotus Talk in a long while. Thanks for being so generous with the community! Kyle I have been to your barn.......Ive seen your cars.....but this post has been AMAZING!! Thank you so much for sharing your barn to this community!! Thank you. And I agree with your assesment of the Europa. I have had it long enough to look at it as routine, but every time I walk into the Barn my eyes are immediately drawn to it. I do not have extensive seat time in the Plus2 yet, but the I have I have enjoyed immensely. The start from stop has a little of the axle wind up Elans of all kinds are famous for. The seating position is really comfortable. There is not problem with ventilation. With windows closed and vents open there is plenty of flow through the passenger compartment. With windows open there is even more air flow but not a lot of buffeting. I think this is becaue the seats are fairly far forward relative to the the window and that there are good extraction vents in the rear. The boot is vacuous, I could easily fit enough luggage for my wife and I to last a weekend. I probably need new dampers in my car because I don't find it as reponsive as I would like in twisty road driving, and i do beleive it is the dampers, rather than the design itself. Highway driving is a real pleasure. Driving at higher than legal speed for extended periods is easy - at least it is with the 5 speed, I have had the pleasure of a 4 speed Plus 2. The cabin and dash, in the Plus 2S 130/5 at least is very luxurious, quite srprising really for a Lotus. But then in period it was quite expensive so it needed to be well appointed. There are guages for everything, a map light, a radio (AM) and even an ambient temperature guage. I love mine, but if when I was buying one of the JPS Plus 2's were available I would have gone for it. The JPS color scheme it universally elegant, but the Plus with a black body and gold metal flake roof is sublime. I glad you enjoyed my presentation. Good luck in your quest for a Plus 2. Nice ones are hard to find. I told you, Kyle, you've made some kind of Lotustalk history here. I also believe that tomorrow's event will extend the liefspan of this thread quite a lot. YouTube - ULTIMATE LOTUS GARAGE! Great video Jim, if I had known you were doing a video I would have made myself available to open the cars up more. Well done indeed. hey, do you have a closeup shot of the first left picture in this image? I am fascinated by the x180r and i dont think ive ever seen that poster/art. This poster was done by graphic artist Dave FeFevers. Dave was an active member of Lotus Limited during the time of the Lotus Sport X180R racing team, and friends with Doc Bundy. To commemorate Doc's '92 IMSA Bridgestone Supercars Drivers Championship Dave did his own limited edition artwork and print. I don't know that they were ever on sale. I got mine from My friend and fellow Lotus enthusiast Zack Zarcadoulas. The print is numbered - mine is 24/92, and signed by Dave and Doc. Dave also did the artwork for the LOG 16 event poster which featured the Esprit. Since you got me thinking about him I pulled it out of my portfolio and am going to get it framed for hanging in the Barn along with a gift from gospeedv8. Both posters are fantastic ^^^. And your other pics are fantastic. And your cars are fantastic. And your barn is fantastic. Kyle also forgot to mention that his barn is pretty useful for working on cars We (actually I) ran into a few issues fitting the driving lights (a rusty bolt and hands to big to reach the connectors) so Kyle offered to help remove the Clam and do it at his place. (I still haven't thanked him for assuming the Lotus position under the dash to plug in the relay ) So heres a few pics of the barn in 'work mode' and my girl with kyles 'family' during her sleepover. If you made a U shaped enclosure around the air compressor and lined it with sound dampening panels, the compressor would be a lot more acceptable. 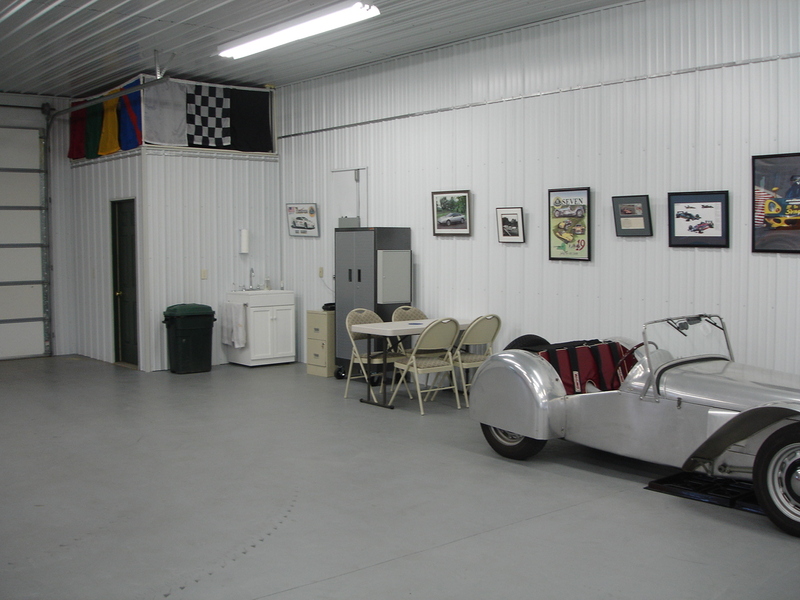 Sorry hearing about your experience with epoxy floor paint. There are lots of brands out there. The best will literally last 20 years being subjected to acids, etc. They will not show wear or lift due to hot tires.